Last week was the third meeting of the DSMMQG, and as the reluctant-yet-willing-to-give-it-try leader of the group, I issued them a challenge this month. The challenge was to create (or at least wear) a handmade nametag to the meeting. There would be two door prizes, donated by your truly, but in order to qualify for a doorpize, you had to be wearing a nametag. Almost everyone complied… some (including myself) wore handmade nametags that someone had made for them as part of a past retreat, etc. But, I had told the group that was allowed, if they didn’t have time to make a new nametag. Expectant Mom, Crystal, very cleverly included her little one as part of her “Little Folks” nametag. Veronica (the same Veronica that created my Eleanor–up there in my blog header!) does some greatsmall scale work, and her hand embroidered nametag with appliqued hexies is a prime example! 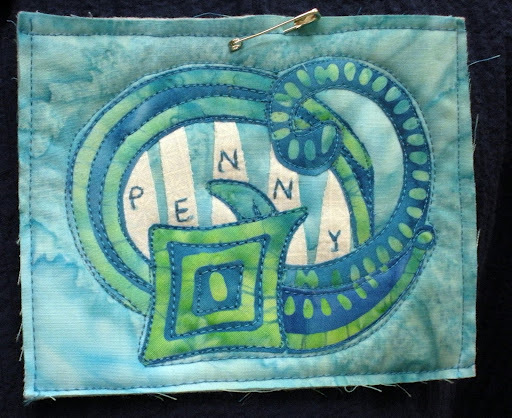 Penny’s batik, fussy-cut, raw-edge applique creation is full of modern movement! Eva Marie utilized the machine embroidery function of her machine to create her tag–I love the birdie’s on the wrought-iron fence! 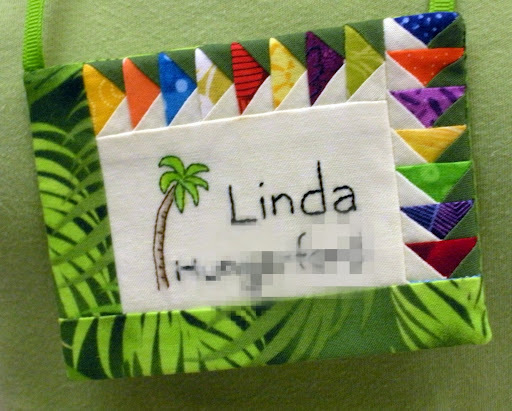 And Linda, got fussy with tiny paper-piecing… she blogged her nametag here. We had some fun Show & Tell pieces, too… Here are a few, but you can see the rest on our flickr site. Next meeting of the DSMMQG is August 15, 6:30 pm. I need to make me a name tag. 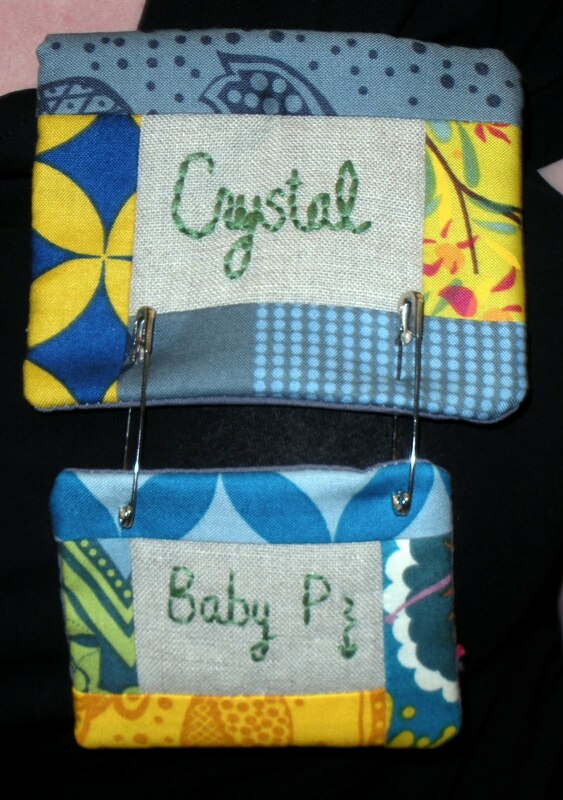 REALLY cute name tags!! I love that they put a lot of effort into them! so cute! Hi. I'm in Ames and would love to come to your next meeting if I can. 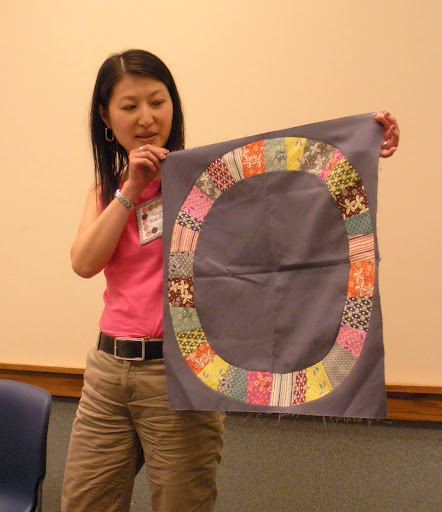 I have very little quilting experience, but I want to learn more and love modern quilts. Would I need to bring anything to the meeting? A name tag? What fun. Those are neat nametags. People really took the task seriously. I love the little hexies. Great name tags! Love the uniqueness of them all! My goodness, you've been busy. Your cats are hysterical, the cake looks beautiful, and that salad — I may have to try that recipe, but only if My Cowboy's gone for the day or something. I so wish I lived close enough to be in your Modern Quilt Guild. There isn't one close to me . . .
Looks like a great time! The tags are darling! i love the quilted nametag challenge. such a great idea! there are some very cute and creative ones. good for you for being the reluctant but still willing leader of the group! Well it looks like those ladies met the challenge. Look at those tiny hexies and geese. You go girls!